I work as a SQL Server Administrator near Dallas Texas. I started working with databases over 20 years ago now. Back in the day, when the world was young, I started out working with Foxpro for DOS. It’s been awhile though, so I’m afraid I can barely spell “Foxpro” anymore. I’ve been working in SQL Server for over 15 years now with a fairly even split between administration and development. This blog is to share some of the interesting bits and pieces I’ve either learned over the years or that I’m just now learning. If anyone has any suggestions for me to write about or questions about what I’ve already written I would love to hear them. I can almost always be found hanging out on twitter so stop by and say hi! Honored to be considered a Microsoft Data Platform MVP. I am getting ready to take the 70-432 Microsoft SQL Server 2008, Implementation and Maintenance exam. This will be my first time taking a Microsoft certification exam. I was wondering if you could provide me with any advice for passing the exam. Also I will be at the PASS Summit 2012 are you going? Simple example I know but if the difference between the two answers is buried in a bunch of code it may not be easy to see, even though it’s as simple as NULL or NOT NULL. Thank You, I will keep you posted. I am taking the test on Tuesday the 5th at PASS. I would take them in the easiest to hardest order personally. IE Whatever is easiest for you. I did data first, then admin and still need to do BI. Looks like an interesting blog you’ve got here. I noticed you’re in Dallas. I just moved here a couple of months ago. Is it always this wet in the fall? I grew up in New England and spent the last few yeas in a tiny little town about 45 minutes south of Charlotte, NC. I’m not sure I’m prepared for a Dallas summer. We’ll see, I guess. No one is prepared for a Dallas summer 🙂 Well except for those that live in places like Phoenix or Death Valley. The SELECT permission was denied on the object ‘Checking’, database ‘AdventureWorks2012’, schema ‘dbo’. But, you’ve already tried too by now 😮 Good seeing you, and great job on the presentation. I have a question about the query just above the site… I mean the query which is shown in the top of the site. I wanna know what it is going to show? what does the query mean? I see a lot of these replies are several years old. I was wondering if you are still active on this blog? If so, do you have any recommendations for passing the 70-461 exam? Yep. I’m still active. That’s the exam for SQL 2012 & 2014 right? I’d start by looking at the exam objectives and see how you stack up. There are also several “training kits” (books you can find on Amazon) and at least MeasureUp has a practice test you can buy and try out. Ah, your there. Awesome. So many sites I have been to have long since been abandoned. 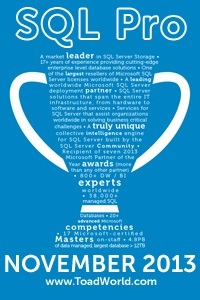 Yes, I am working on taking the 70-461 SQL Server 2012 exam. I have been studying the “Querying Microsoft SQL Server 2012” book and went through the “Querying Microsoft SQL Server 2012 Jump Start” videos on MVA. I just wondered if there is anything else I could use to study for this? I just don’t want to fail on my first try. I haven’t been in any school or testing environment for more decades that I care to admit, so I’m a little nervous about taking the test. Yea, my best advice at that point is to review the tested subjects on the exam site and make sure you are completely comfortable with each category. (https://www.microsoft.com/en-us/learning/exam-70-461.aspx). After that if you are still uncomfortable get a practice exam from Measureup. They are a little over $100 but the biggest benefit for me has always been peace of mind. Also depending on when you purchase the exam there is sometimes a free retake option that you can get. Thanks for the advice. I plan on taking the exam in the next few weeks. I thought about buying some brain dumps, just to see how the questions are worded on the exam. Any comments or suggested brain dump sites? I don’t really like brain dumps. They go against the spirit (and in many cases the laws) of the exams. In fact, depending on the brain dump if MS catches you using them they will revoke the certification and ban you (I think) from getting others. I’d stick with something like Measureup’s practice tests. Holly SQL Macros, Thanks for the caution. I didn’t know. Okay, I’ll stick with MeasureUp and my books. On a side note, there’s you a subject for an article, SQL macros and macro sets.